Iron, in its many forms, often alloyed with other metals and materials has been solving engineering design problems for centuries. The metal became so important that a whole period of history was named after it, The Iron Age, as the use of wrought and forged iron and steel superseded the use of bronze. The term grey is used because of the colour of the fracture surface if a piece is broken. If molten cast iron is allowed to cool normally the carbon comes out of solution and forms flakes of graphite which run through the ferrite/pearlite matrix, hence the alternative term, flake graphite iron. These flakes are at the microscopic level, the ends of which form stress points in the cast iron. If cast iron is subject to a compressive load these stress points are not particularly detrimental and flake graphite cast iron is excellent under compressive load, although its use is more limited in situations where it is subject to bending or shock loading. Grey cast iron came into its own during the industrial revolution when improved production methods and understanding of the metallurgy led to more a reliable material that could be cast into an increasing number of different shapes and section thicknesses. The Victorian era saw an explosion in the use of cast iron and that has continued to this day due to the combination of the ability to cast complex shapes at low cost compared to other production methods and materials. Call Durham Foundry on 0114 249 4977 to discuss your Cast Iron & Cast Iron Castings project. At Durham Foundry we have been producing grey iron castings for over a hundred years. As well as grey iron castings, our customer base also covers ductile and alloyed irons for the engineering, decorative, architectural and artistic sectors and we can supply castings from one off up to small to medium batch production using Alkali Phenolic resin bonded sands. Our workforce of highly skilled moulders can work from complex loose pattern equipment, particularly where low volumes are required, whilst our moulding line is suited for batch production. Our long trading history, coupled with an investment programme that has enabled us to keep up with modern production methods and environmental legislation has meant that we have been involved with many projects requiring ductile iron castings and continue to be so. All our grey iron castings are produced to the current ISO material specification, ISO 185 2005, along with any further certification which a customer may require. 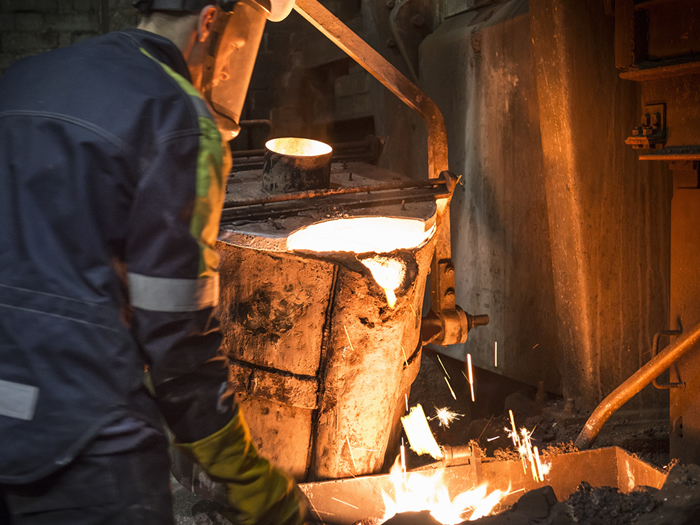 Our diverse customer base has also given us experience in a wide range of applications for grey iron castings , including pumps and valves, forges, foundries and rolling mills, automotive and aerospace, a wide range of OEMs, quarries and mines, railways and rolling stock, local authorities and artists and sculptors. We also have long term trading relationships with local pattern makers, machine shops and surface finishers which enable us to quote for the complete supply of the finished casting. One area of potential confusion is the spelling of the word ‘grey’. This can be spelt either as ‘grey’ or as ‘gray’ although gray tends to be an American usage.